This space wallpaper shows the comparative sizes of nine asteroids. 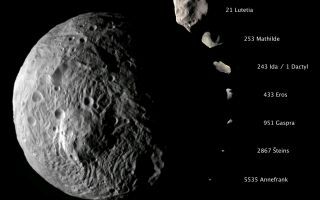 Up until now, Lutetia, with a diameter of 81 miles (130 kilometers), was the largest asteroid visited by a spacecraft, which occurred during a flyby. Vesta, which is also considered a protoplanet because it's a large body that almost became a planet, dwarfs all other small bodies in this image, with its diameter sizing up at approximately 330 miles (530 kilometers).